with one heavy hexagon nut, on the longer 2A fit side. 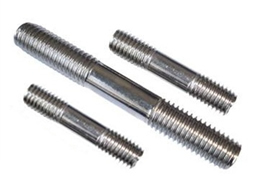 The shorter 3A fit side is inserted into a threaded hole. Inconel 718 is typically used in high strength applications where fastener operating temperatures can reach 700 degrees Celsius. Oxidization, thermal cycling and high pressures can create mayhem in bolted joints causing fasteners to loosen and lose grip strength. The top wellhead and valve OEMs count on High Temperature Bolting both Studs and Bolts for extreme temperatures applications. 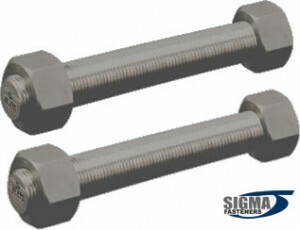 Sigma Fasteners is a leader in manufacturing Inconel 718 bolting. Minimize oxidation and corrosion at high temperature. Optional coatings to minimize galling. Sigma can lower your cost for tap end studs with contract pricing or managed inventory.Sigma can supply nuts and bolts or studs.